Too often, offices are uninspiring, corporate spaces where a chrome printer classifies as a cool accent piece. Even home offices can be tricky to design. It’s tough to maneuver the line between personal and professional. If you find yourself in the latter position and want to make your workplace a more design-friendly yet efficient space, look no further for inspiration than Katie Rodgers’s stunning studio. Rodgers, an artist whose brightly hued, whimsical pieces are instantly recognizable, found the light-filled Upper East Side studio after a two-year search. Having worked from home for seven years, she was ready to take the plunge and move her workspace to a different location entirely. This space ticked off all her wish list items: tons of natural light, an outdoor area where she can grow the plants that inspire her artwork, and wood floors. She added a farmhouse sink before moving in to add extra character to the charming space and kept all her furniture neutral and wooden to allow the color from her paints and art pieces to steal the show. It’s a place where she feels inspired and motivated to work. Yet despite the separation of work and home, her studio still feels homey—like the loft of your coolest friend who always hosts the best dinner parties and says things like “I picked up this cavatelli recipe when I lived in Tuscany for a month”—and anything but corporate. For this reason, it’s the perfect space to pull inspo from for anyone designing their own workspace, whether that happens to be in a separate office or in the basement of their house. And while this more creative layout might not be for everyone, there are certain lessons we can pull from how Rodgers crafted an environment that feels like an extension of her home. Keep reading for tips on creating a workspace you’ll actually want to work in. Eschew traditional office furniture for more elevated items. Rodgers is a big fan of vintage and antiques, taking to local shops as well as online retailers like One Kings Lane (which has a vintage section) and 1stdibs (“I got my flat file cabinet from there; I like that you can negotiate for things, and it’s fun to set up alerts for different things”). 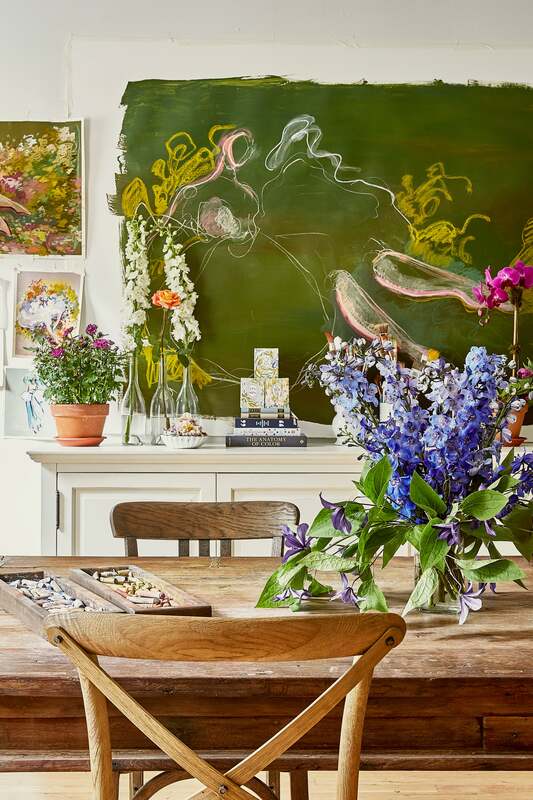 If you couldn’t tell from her gorgeous paintings (many of which heavily feature floral motifs), Rodgers is a big fan of incorporating live flowers and greenery into her studio. It’s an easy way to squeeze a bit of life and color into even the tiniest of offices.